Mezco unleashes the Mega Scale Exorcist with Sound Feature figure and its sure to make your head spin.Standing at a menacing 15 inches tall, Regan MacNeil from The Exorcist is presented in a real cloth nightgown from the film. The possessed youth says 6 iconic and hair-raising phrases including It burns! and Keep away! The sow is mine!. The devil is in the details and each of them have been captured here; from Regans untamed real hair to her crazed, piercing eyes and maniacal grin. This Mega Scale Exorcist figure features 11 points of articulation for dynamic nightmarish poses. 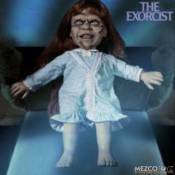 Breaking onto the cinematic scene in 1973, The Exorcist became the first horror film to be nominated for an Academy Award. The film tells the spine-tingling story of the demonic possession of a young girl, and a mothers fight to save her daughter through an exorcism. The Mega Scale Exorcist figure comes packaged in a collector-friendly window box, perfect for display.